Pocillopora grandis in Mo’orea, French Polynesia. Coral reefs the world over have been hammered in recent years by everything from disease outbreaks and storm damage to severe heat stress and bleaching. The main culprits are warmer temperatures and more acidic water, thanks to the far-reaching impacts of excess CO2 from the burning of fossil fuels. Amidst this doom and gloom, however, a recent study by Mo’orea Coral Reef LTER researchers provides a glimmer of hope for reef survival. They found that after a five-year period of massive coral cover loss in Mo’orea’s outer reefs (down to less than 3% live coral), a rapid population re-growth led to an astounding recovery of 25-74% live coral cover only 7 years later—likely one of the highest coral reef recovery rates recorded to date. Unlike the chronic coral reef degradation and mortality observed in regions like the Caribbean and Great Barrier Reef, Mo’orea’s outer reef communities have shown high resilience to changing ocean conditions over the last decade. These corals have responded to major disturbances via a process of death followed by rapid replacement by millions of coral colonies (especially Pocillopora species) with high genetic diversity. LTER scientists hypothesize that this large genetic upheaval of Pocillopora populations may be facilitating natural selection for genotypes that are resistant to warmer seawater in a process called ‘evolutionary rescue’ (ER). In ER, a population facing an elevated risk of extinction through reductions in size recovers via high recruitment, gene flow, and genetic adaptation, with adaptive evolution serving as the mechanism of rescue. The observed pattern of disturbance and repopulation on Mo’orea’s reefs meet three critical requirements that increase the likelihood of ER: large initial populations, high initial genetic variation, and gradually changing environmental conditions. If ER underlies the pattern of recent changes affecting the coral communities of Mo’orea then this region also could be an area in which corals have the potential to undergo rapid genetic adaptation to changing environmental conditions like rising temperatures that act as selective forces. Therefore, the recovery of out reef coral communities around Mo’orea may include an increased capacity to respond to future conditions due to the diversity of coral recruits, at least among Pocillopora species. 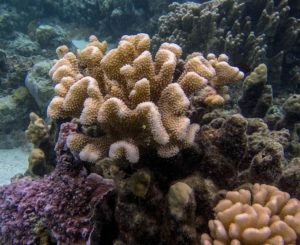 Some of the other common coral species monitored over the study period had smaller initial population sizes and weaker recovery patterns, indicating a much lower likelihood that ER is at play. This means that while future reefs around Mo’orea may be more resilient to environmental disturbance, community composition may be quite different and favor genera like Pocillopora that have a diverse genetic pool of larval replacements to draw from. Edmunds, Peter. Implications of high rates of sexual recruitment in driving rapid reef recovery in Mo’orea, French Polynesia. Scientific Reports 8(1): December 2018.